This article is about autonomous exploration vehicles. For crewed vehicles on Mars, see Crewed Mars rover. Artist's conception of the Curiosity rover vaporizing rock on Mars. The rover landed on Mars in August 2012. There have been four successful robotically operated Mars rovers, all managed by the Jet Propulsion Laboratory: Sojourner, Opportunity, Spirit and Curiosity. On January 24, 2016, NASA reported that current studies on Mars by Curiosity and Opportunity (the latter now defunct) would be searching for evidence of ancient life, including a biosphere based on autotrophic, chemotrophic or chemolithoautotrophic microorganisms, as well as ancient water, including fluvio-lacustrine environments (plains related to ancient rivers or lakes) that may have been habitable. The search for evidence of habitability, taphonomy (related to fossils), and organic carbon on Mars is now a primary NASA objective. In June 2018, Opportunity went out of contact after going into hibernation mode in a dust storm. NASA declared the Opportunity mission ended on February 13, 2019, after numerous failures to wake up the rover from the repeated signals. Mars 2, Mars 3 were physically tethered probes; Sojourner was dependent on the Mars Pathfinder base station for communication with Earth; MER-A & B and Curiosity were on their own. As of February 2019, Curiosity is still active, while Spirit, Opportunity, and Sojourner completed their missions before losing contact. 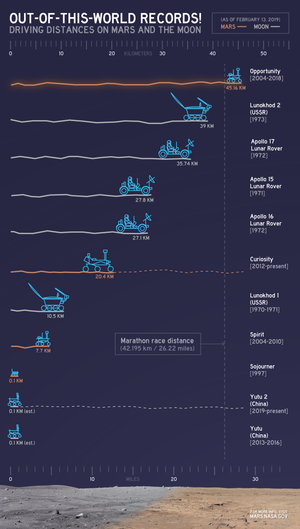 Comparison of distances driven by various wheeled vehicles on the surface of the Moon and Mars. Mars 2, Prop-M rover, 1971, Mars 2 landing failed taking Prop-M with it. The Mars 2 and 3 spacecraft from the Soviet Union had identical 4.5 kg Prop-M rovers. They were to move on skis while connected to the landers with cables. Mars 3, Prop-M rover, 1971, lost when Mars 3 lander stopped communicating about 20 seconds after landing. Sojourner rover, Mars Pathfinder, landed successfully on July 4, 1997. Communications were lost on September 27, 1997. Spirit (MER-A), Mars Exploration Rover, launched on June 10, 2003, and landed on January 4, 2004. Nearly 6 years after the original mission limit, Spirit had covered a total distance of 7.73 km (4.80 mi) but its wheels became trapped in sand. The last communication received from the rover was on March 22, 2010, and NASA ceased attempts to re-establish communication on May 25, 2011. Opportunity (MER-B), Mars Exploration Rover, launched on July 7, 2003 and landed on January 25, 2004. Opportunity surpassed the previous records for longevity at 5,352 sols (5498 Earth days from landing to mission end; 15 Earth years or 8 Martian years) and covered a total distance of 40.25 km (25.01 mi). The rover sent its last status on 10 June 2018 when a global 2018 Mars dust storm blocked the sunlight needed to recharge its batteries. After hundreds of attempts to reactivate the rover, NASA declared the mission complete on February 13, 2019. Curiosity of the Mars Science Laboratory (MSL) mission by NASA, was launched November 26, 2011 and landed at the Aeolis Palus plain near Aeolis Mons (informally "Mount Sharp") in Gale Crater on August 6, 2012. The Curiosity rover is still operational as of April 22, 2019. Astrobiology Field Laboratory, proposed in the 2000-2010 period as a follow on to MSL. Zephyr rover, would use a rigid sail for wind propulsion. Mars Tumbleweed Rover, a spherical wind-propelled rover. In 2018, a kind of cushion-air rover was proposed, which in contrast with traditional hovercrafts does not use blowers to pressurize the gas in the chamber but rather uses stored pressurized CO2 obtained from a freezing process which does not require mechanical compression. Curiosity's (MSL) rover "hand" featuring a suite of instruments on a rotating "wrist", "Mount Sharp" is in the background (September 8, 2012). Interactive imagemap of the global topography of Mars, overlain with locations of Mars landers and rovers. Hover your mouse to see the names of over 25 prominent geographic features, and click to link to them. Coloring of the base map indicates relative elevations, based on data from the Mars Orbiter Laser Altimeter on NASA's Mars Global Surveyor. Whites and browns indicate the highest elevations (7004120000000000000♠+12 to +8 km); followed by reds and pinks (7003300000000000000♠+3 to +8 km); yellow is 5000000000000000000♠0 km; greens and blues are lower elevation (down to 2996200000000000000♠−8 km). Axes are latitude and longitude; Poles are not shown. NASA distinguishes between "mission" objectives and "science" objectives. Mission objectives are related to progress in space technology and development processes. Science objectives are met by the instruments during their mission in space. The science instruments are chosen and designed based on the science objectives and goals. The primary goal of the Spirit and Opportunity rovers was to investigate "the history of water on Mars". Panorama of Husband Hill taken by the Spirit rover (November, 2005). Sojourner rover atop Pathfinder lander. Comparison: Mars Sojourner rover, MER, MSL. Comparison: MER, Sojourner rover, MSL. Martian sunset viewed by the Spirit rover (May 2005). Opportunity rover later visited its heat shield impact site; it was ejected during the rover's descent and impacted the surface separately. ^ a b Grotzinger, John P. (January 24, 2014). "Introduction to Special Issue - Habitability, Taphonomy, and the Search for Organic Carbon on Mars". Science. 343 (6169): 386–387. Bibcode:2014Sci...343..386G. doi:10.1126/science.1249944. PMID 24458635. Retrieved January 24, 2014. ^ "NASA declares Mars rover Opportunity dead after 15 years on the red planet". The Daily Telegraph. February 13, 2019. ^ a b "Mars 2 Lander". NASA NSSDC. Retrieved 2008-06-25. ^ a b "Mars Exploration". 10 August 2012. Retrieved 2012-08-10. ^ Boyle, Alan. "Good moves on Mars". MSNBC. Retrieved 2010-01-22. ^ "NASA Concludes Attempts To Contact Mars Rover Spirit". NASA. May 24, 2011. ^ "Mars Exploration Rover Mission: All Opportunity Updates". mars.nasa.gov. Retrieved 31 October 2018. ^ "Mars Science Laboratory Launch". 26 November 2011. Retrieved 2011-11-26. ^ Associated Press (26 November 2011). "NASA Launches Super-Size Rover to Mars: 'Go, Go!'". New York Times. Retrieved 2011-11-26. ^ USGS (16 May 2012). "Three New Names Approved for Features on Mars". USGS. Retrieved 28 May 2012. ^ NASA Staff (27 March 2012). "'Mount Sharp' on Mars Compared to Three Big Mountains on Earth". NASA. Retrieved 31 March 2012. ^ Agle, D. C. (28 March 2012). "'Mount Sharp' On Mars Links Geology's Past and Future". NASA. Retrieved 31 March 2012. ^ Staff (29 March 2012). "NASA's New Mars Rover Will Explore Towering 'Mount Sharp'". Space.com. Retrieved 30 March 2012. ^ Webster, Guy; Brown, Dwayne (22 July 2011). "NASA's Next Mars Rover To Land At Gale Crater". NASA JPL. Retrieved 2011-07-22. ^ Chow, Dennis (22 July 2011). "NASA's Next Mars Rover to Land at Huge Gale Crater". Space.com. Retrieved 2011-07-22. ^ Amos, Jonathan (22 July 2011). "Mars rover aims for deep crater". BBC News. Retrieved 2011-07-22. ^ de Selding, Peter B. (20 April 2011). "ESA Halts Work on ExoMars Orbiter and Rover". Space News. Retrieved 2011-04-21. ^ Svitak, Amy (18 April 2011). "U.S., Europe Plan Single-rover Mars Mission for 2018". Space News. Retrieved 2011-04-21. ^ "NASA - NSSDCA - Spacecraft - Details". ^ Kimberly W. Land (May 13, 2003). "A new way to explore the surface of Mars". NASA. Retrieved 2011-04-04. ^ The Tumbleweed Rover is on a Roll. Anna Heiney, KSC NASA. 11 March 2004. ^ Arias, Francisco. J (2018). CO2-Cushion Vehicle for Mars. An Alternative Locomotion for Exploration Rovers. 54nd AIAA/SAE/ASEE Joint Propulsion Conference Cincinnati, OH, Propulsion and Energy, (AIAA 2018–4492). doi:10.2514/6.2018-4492. ISBN 978-1-62410-570-8. ^ Arias, Francisco. J (2018). A Method of Attaining High Pressurized Vessels in Space, the Moon and With Particular Reference to Mars. 54nd AIAA/SAE/ASEE Joint Propulsion Conference Cincinnati, OH, Propulsion and Energy, (AIAA 2018–4688). doi:10.2514/6.2018-4488. ISBN 978-1-62410-571-5. ^ "Mars Exploration Rover Mission: Overview". marsrovers.nasa.gov. Retrieved 2008-06-25. ^ "Mars Exploration Rover Mission: Science – Looking for signs of past water on Mars". marsrovers.nasa.gov. Retrieved 2008-06-25. Missions are ordered by launch date. Sign † indicates failure en route or before intended mission data returned.